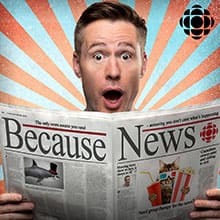 Gavin Crawford hosts Canada's funniest news quiz. Download Comedian Martha Chaves takes the news quiz. Download Opera star Ben Heppner takes the news quiz. Download Game. Set. Quiz: A tennis volley on Because News.